Hey Folks! The month of March marks the 3rd Blogiversary of Say Grace. Can you believe it? Where does the time go? I feel like it was Just yesterday when I shared my very first blog post for my Buffalo Chicken Sandwich. Drool. What a fan favorite!!! I am so grateful for this little corner of the internet as well as God’s faithfulness to hear and answer prayer. To God be the glory for the great things He has done! 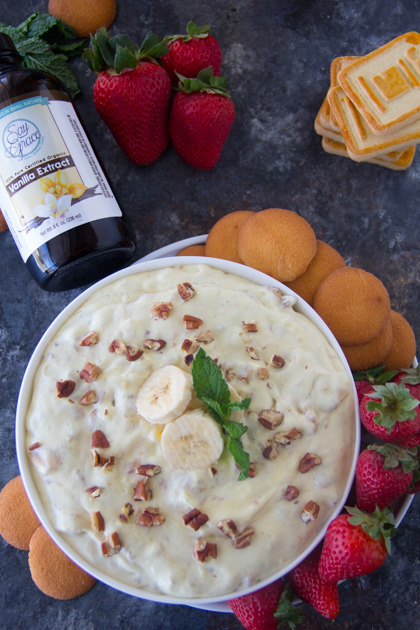 So I wanted to celebrate the 3rd Blogiversary with one of my favorite desserts, Banana Pudding Dip which is basically a deconstructed banana pudding. Who doesn’t love banana pudding?!?!?!? It’s even better when you can just dip and go!! Lol!! What an experience!!!! 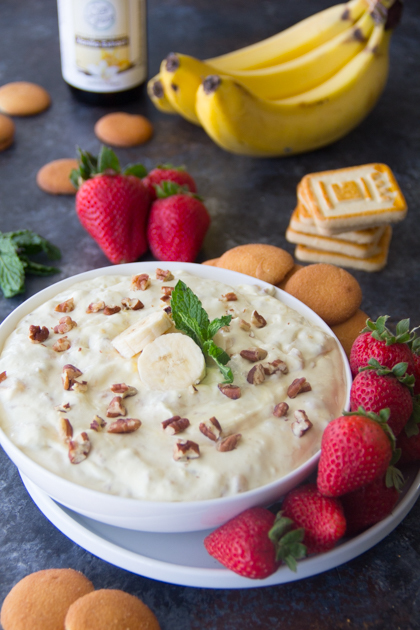 This banana pudding dip is crazy delicious and does really well at parties, gatherings and such! It has definitely been another great year here at Say Grace and I couldn’t have done it without all of your support and encouragement throughout the year. Just to say, “Thank You”, I’m giving away a bottle of my very own Say Grace Homemade Organic Vanilla Extract as well as a $50 gift card to the Say Grace Kitchen Boutique. What a darling little store that reminds me of God’s faithfulness. 1 winner will receive an 8 oz. Say Grace Homemade Organic Vanilla Extract as well as a $50 gift card to the Say Grace Kitchen Boutique. Bonus: Sharing is caring!!! You’ll get an extra entry for each person that enters via your GLEAM share link so sharing on social media will yield the most entries for you. Giveaway ends at 12:01 am EST on Thursday, March 29th. One winner will be chosen randomly via Gleam.com and notified by email. Now back to this lovely Banana Pudding Dip. I added nuts for that added crunch as well as some of my homemade vanilla extract for even more depth of flavor. Hubby stood over the counter and clobbered this banana pudding dip. Momma called and told me how much she loved it. 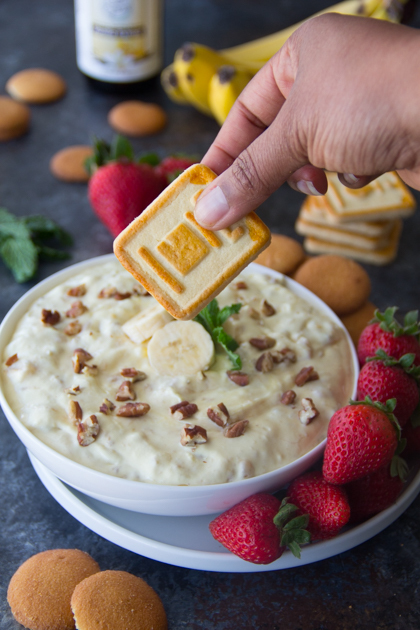 So I think it’s safe to say that this banana pudding dip is a HUGE hit. Hope you’ll try it. Say Grace and enjoy!! In a small bowl, combine the milk and pudding mix and blend well with an electric hand mixer. In a larger bowl, combine the cream cheese, condensed milk and vanilla extract together and mix until smooth. Fold the whipped topping into the cream cheese mixture. Add the pudding mixture to the cream cheese mixture and stir until well blended. Combine mashed banana and nuts into the mixture well. Transfer mixture to a serving bowl and serve with desired dippers. Say Grace and enjoy! 3rd Blogiversary Say Grace Kitchen Boutique Gift Card Giveaway!!! Could you substitute the dairy products with dairy free alternatives? This looks so yummy!!! Hi Randi! I have never made this recipe other than as written. Feel free to experiment with vegan condensed milk, vegan whipped cream, vegan cream cheese, and vegan cookies in the health food store if you wish. Hope this helps! I love anything banana pudding! I am sure I would love this dip! 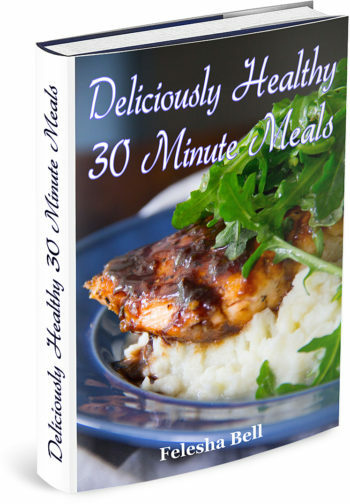 This sounds amazing and so easy to make. I’ll be sharing this with my friends, they love anything banana. This looks tasty; I bet it would be a great dip for pretzels to get the salty-sweet combination. This looks excellent, I love bananas! 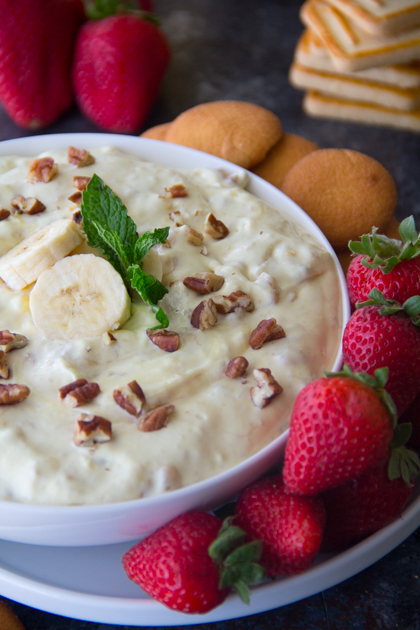 This banana pudding dip looks divine! It’s a great way to enjoy sweets.